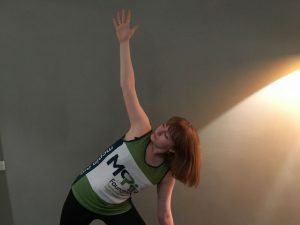 Kat Berry, Operations Manager at the McPin Foundation talks to us about her 30 DAY hot yoga challenge and why she’s raising money for mental health research. Where did the idea to do hot yoga for 30 days come from? I’ve always wanted to do the 30 day challenge but I have always found an excuse not to – either the time commitment or just the fear of knowing how tough it was going to be held me back. It wasn’t until I was lying in a class one day that I had the idea of doing the challenge for charity. I felt if I could do it for a good cause it would give me the motivation to power through the full 30 days. I am looking forward to challenging myself, raising money for mental health research and seeing how 30 days of consecutive yoga affects me. How did you get involved in hot yoga? A friend encouraged me to try Bikram with her, and I found it really tough for the first class, but afterwards I felt better than I had for ages and I was ready to try it again. Not long after that I tried Fierce Grace and I loved the variety of classes, 3 years on I have never looked back. Have you got any tips for people looking to try Hot Yoga? Take your time, pace yourself and have a rest if you need one. Yoga is not a race and it is easy to keep comparing yourself with others in the room. I have been practising long enough now to realise where my strengths and weaknesses are, and I am no longer fighting my body but trying to work with it. Progress may be slow but it is always fantastic when you can stand that bit straighter or reach that millimetre further. Why did you pick the McPin Foundation as your charity? I’ve recently started working for the McPin Foundation, a mental health research charity that puts people with lived experience at the heart of the research process. For me the importance of mental health and wellbeing is all too often overlooked. Having previously worked in research I have always been passionate that research can help to build our understanding of mental health problems and build better wellbeing for everyone. Personally, I have found that practising yoga regularly helps me with my own mental health and dealing with stress. Regular practise encourages me to take care of myself and spending an hour and a half in a hot sweaty room gives me time to focus on myself and forget what is going on in the outside world. What do you think will be the biggest challenges you’ll face in your hot yoga marathon? I think for me the biggest challenge will be making sure I’m motivated to get up early for those early morning classes before work. I’ve been on yoga retreats in the past and the longest back to back stretch I have done is ten days, which was challenging enough. One of the biggest obstacles is going to be battling through the muscle ache to get myself into that next class! If you would like to sponsor Kat’s 30 day hot yoga challenge and support lifesaving mental health research please visit Kat’s fundraising page here. Inspired to complete your own fundraising challenge to raise money for life-saving mental health research? Contact us at contact@mcpin.org for advice and to be featured on our website.